matter yet to occur in the open cold matter model of ~90 billion years. dimension to 1078) and hence the mass would be 1052 kg. be about 10% (1051 kg) of that estimate. where H is Hubble’s parameter. tualization of both Euclidean and non-Euclidean space. tional levels but wrapped within four-dimensional space. would be static (fixed) because there would be no time. formation is ~14% of the ultimate boundary condition. of potential mass, not yet manifested, is one implication. faces of the universal boundary would be 54 µm . T4 and the constant 5.67 × 10−8 W/m2, or 0.45 W/m2. upon 1052 kg or 8πG/c4·Tuv. present inferential measurement of the virtual condition. 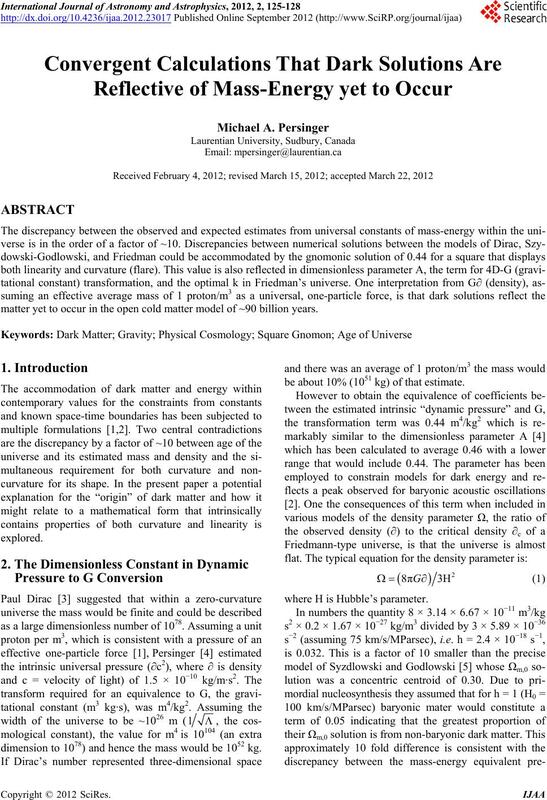 Thanks to Blake T. Dotta, Lucas Tessaro and Ghislaine F.
Physics, Vol. 5, 2003, pp. 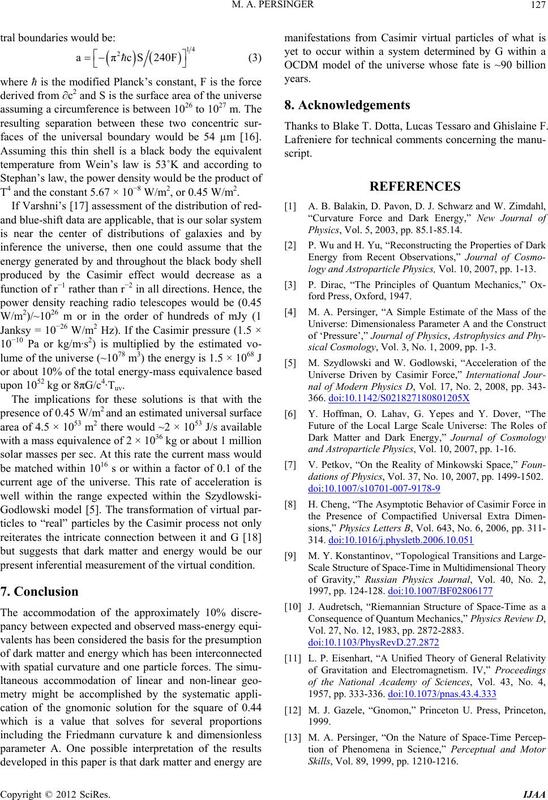 85.1-85.14.
logy and Astroparticle Physics, Vol. 10, 2007, pp. 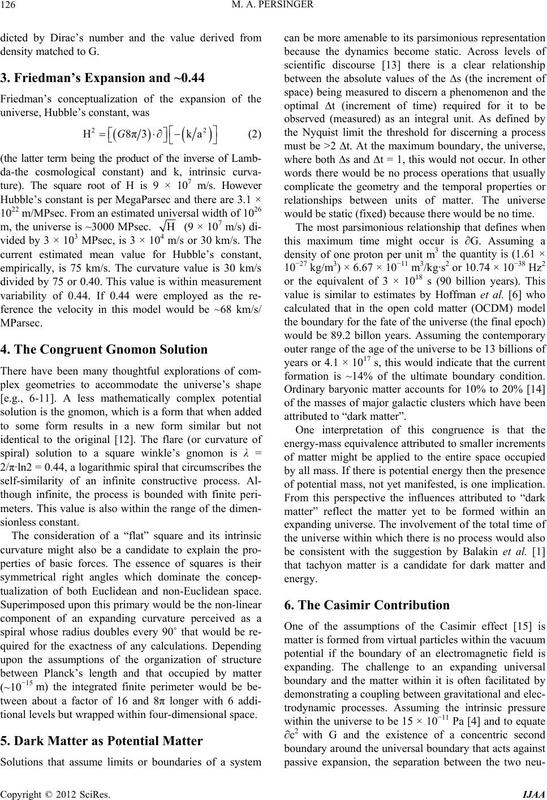 1-13.
sical Cosmology, Vol. 3, No. 1, 2009, pp. 1-3.
and Astroparticle Physics, Vol. 10, 2007, pp. 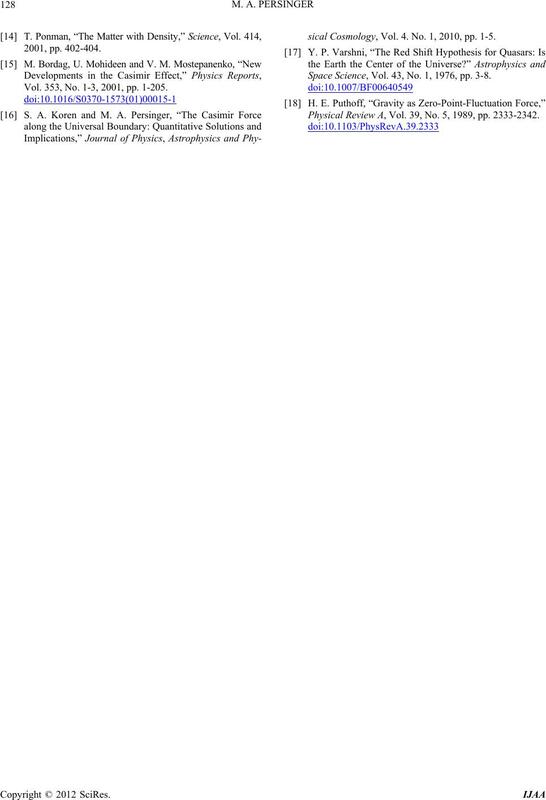 1-16.
dations of Physics, Vol. 37, No. 10, 2007, pp. 1499-1502. Vol. 27, No. 12, 1983, pp. 2872-2883. Skills, Vol. 89, 1999, pp. 1210-1216. Vol. 353, No. 1-3, 2001, pp. 1-205.
sical Cosmology, Vol. 4. No. 1, 2010, pp. 1-5. Space Science, Vol. 43, No. 1, 1976, pp. 3-8. Physical Review A, Vol. 39, No. 5, 1989, pp. 2333-2342.